Boston is a tourist-friendly city relative to other cities in the world. New York City has many attractions, but is always mobbed and never sleeps. San Francisco is a beautiful city by the bay, but can be even more expensive than New York. Paris is a bustling, sprawling, metropolis without a defining begin or end point. Welcome to Boston, a popular walking-city, where one can walk through most of the downtown in only a few minutes, take the subway and arrive almost anywhere in the transit system in less than one-half hour, and visit Faneuil Hall, the Cradle of Liberty, as well as many other national historic places where actual events occurred that led to America being borne an independent nation. When visiting Boston, there are many modes of transportation. 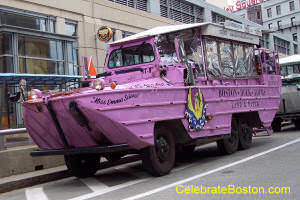 One can take a world-famous Duck Tour (amphibious vehicle) and ride through the city and then cruise right into the Charles River, view Boston from a raised-height tourist bus, take a tourist trolley that allows unlimited boarding, or try a specialized trolley tour with themes such as ghost and graveyard related sites. There are also walking tours, bicycle tours, and even Segway tours available to visitors. Walking tours, both guided and self-guided, are a popular way of seeing much of Boston. Quite often the guide on walking tours is dressed as a famous patriot such as Ben Franklin or Paul Revere, which makes the history topics more interesting for younger visitors. Tourists can also walk the historic Freedom Trail without a guide, or listen to a downloadable description of the Harborwalk path along the waterfront, as an alternative to traditional tours.